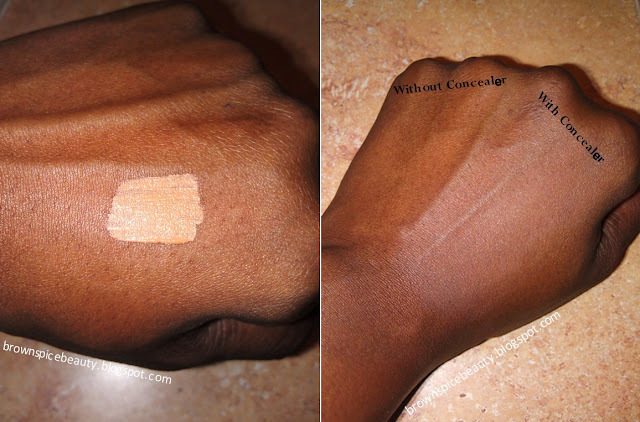 BrownSpiceBeauty: SimplyVera Vera Wang Cosmetics Illuminating Concealer Review! Hello Brown Spice Beauties! I have missed you guys. :-) Now, let's get right down to business. I was doing some shopping over the weekend at Kohl's and just as I was getting ready to meet up with my sweetie in another department, I happend to walk by the cosmetics area and a product caught my eye. When you know your skin color well, you can spot a product that may work for you in an instant. It was the SimplyVera Vera Wang Cosmetics Illuminating Concealer. I remember hearing about Vera Wang coming out with a makeup line, but it was totally off of my radar. I made a u-turn and checked out the display. It is only available in 3 shades that are numbered. The color that caught my eye was the deepest shade #204 and the word "illuminating" in the name of the product also peeked my interest. That usually means it will have some ligh reflecting qualities and that is always a must when it comes to your face. This product boasts "Wand applicator gives coverage in one sweep. Shimmering finish lends a light luster." I was already fully made up for the day so, I tried it in the store under my eyes over my existing makeup. It comes in a applicator pen that you twist on the bottom and the product comes through the bristles for use. The pen holds .09 FL OZ of product.This certainly makes it convenient to use and to carry in your makeup kit. Once I applied it under my eyes, I loved what it did. It instantly gave me a brighter look, but I needed to get it home to really give it a true test. The SimplyVera Vera Wang Cosmetics Illuminating Concealer cost $19.50 exclusively at Kohl's so, I scooped it right up. I took shots of the product as soon as I got home. The color looks light in the pictures, but it worked perfectly with my foundation on my richer skin tone. 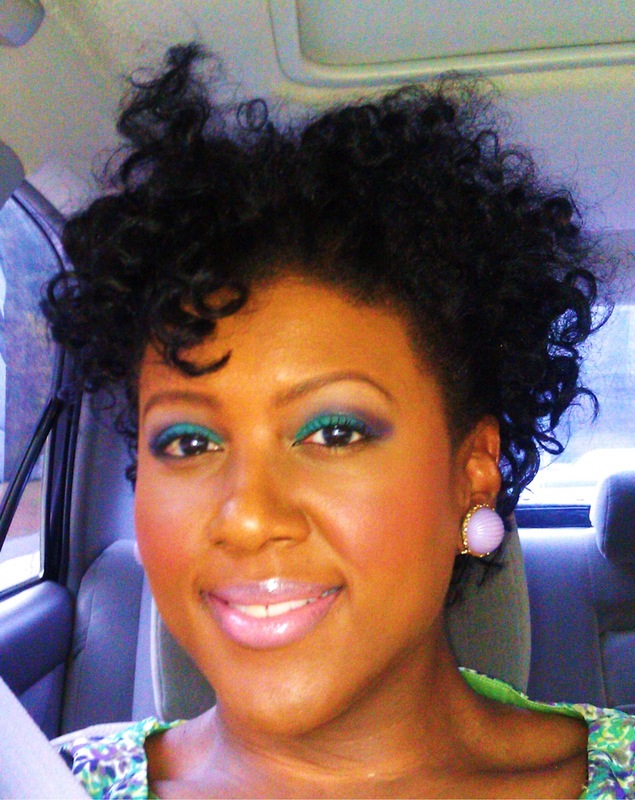 See how the product conceals and brightens my skin? I decided to fully test it out the next day, which happened to be Easer Sunday. I used just my foundation and the SimplyVera Vera Wang Cosmetics Illuminating Concealer under my eyes to see what kind of coverage I would get. It actually covers quite nicely. It also worked great to highlight my cheek bones. I wore it all day and it had great staying power. There was very little if any creasing. Because I have a bit more darkness under my eyes in the corners and on my nose from wearing glasses sometimes, I may use a little bit of my usual concealer along with it in the future. Overall, it did cover well on it's own. Here is a shot of me on Easter Sunday wearing the concealer. Consistency: Very creamy and blends out well. Coverage Good coverage! If you need a lot of coverage, you will need to mix with a heavier concealer our just use this product as a highlighter. Longwear: It lasted all day with no reapplication and very little if any creasing. Shades: It is only available in 3 shades. Hopefully she will expand it in the future. However, with the shades she does offer, it can definitely work on many richer skin tones. Product Claims: Product can be applied in one sweep, but you do need to blend it out. The finish does not really have a shimmer, but it does have a nice lustre that reflects the light nicely. Value/Convenience: The pen applicator is sized just right to take with you and apply on the go. bag. The cost is mid rage and comprable with most department store concealers. Overall, I give this product a BSB Spice Rating of HOT!